Many years ago, James Dyson discovered a problem that needed solving. You see, when he was vacuuming his home he realized that his traditional bagged upright kept losing power. From what he could tell the dust was quickly clogging up the bag and causing a large loss in the suction power. This would happen over and over again, each time he tried to clean his carpets. To solve this problem he decided to build a line of vacuums that would actually work with prolonged use. A little more than 5 years (and over 5,000 prototypes later), the concept of cyclonic and Root Cyclone™ suction was born. This technology is built on the idea of using tremendous centrifugal force to separate fine dust particles from the air without giving the dirt any chance of gathering inside the machine. No clogging means constant power and this would change the vacuum industry for good. Fast forward to today where Dyson has a huge lineup of vacuums including upright, canister, cordless, handheld, and even robot cleaners that will move around your floors on auto-pilot. When you look at everything they have to offer you will quickly notice how different they are than your typical vacuum. A good example of this is their Cinetic Big Ball, a machine that rides on a large sphere with a low center of gravity. Tech radar tested it out and found it to be one of the best performing cleaning machines in its’ class. No bags to buy and a virtually maintenance free design are just a couple of the positive features that make it such an attractive buy. There are several qualities that really set them apart from other popular manufacturers. The biggest is the amount of constant suction power you get from their full sized uprights and canisters. The interior cyclones are arranged in such a way that air flow is maximized as it passes through them. The smallest of dirt and dust particles are separated from the air with such force that there is almost no chance of a clog anywhere inside. Dyson is also known for innovation. If you take a look at their lineup you will quickly see what this means. In addition to their flagship Animal vacuums you can find battery powered cordless models that quickly convert from hand to upright, and back again. You will also see their newest Robot cleaners that can move around your home, sensing where your furniture is. They will clean your home on autopilot with much more performance than the competition. Quality is another big feature, and probably the biggest reason they sell so many vacuums each year. 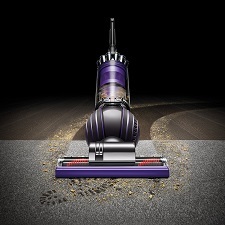 It’s not uncommon to get 10 years or more from your Dyson, all without the added expense of replacement bags or filters. Simply clean your filter once in a while and you will have a machine that operates like new. Their 5 year warranty on most models is a sign that they are not afraid to stand behind their products. The Ball Animal 2 is a full sized upright with more power than any other machine in its’ category. That’s a pretty big claim but they have the data to back it up. And not only can it pull just about any amount of embedded dirt out of the thickest of carpets, it has a highly rated HEPA filter to make sure nothing escapes back into your home. The Ball has around 100 different components layered inside to lower the center of gravity and really allow you to move it around the items in your home. You will spend less time backing up to turn and more time focusing on the job at hand. And since it only weighs a little over 15 pounds you can carry it up and down stairs with only a little effort. In addition to these features you also get a tangle free turbine tool that can remove pet hair from stairs, furniture, and bedding. It acts almost like a small powered vacuum with spinning brushes and powerful suction. The tool makes it simple to get your pet bedding clean without needing to constantly wash it. To read more about it, click here for our indepth review with recommendations on where to find the lowest price. The Dyson Ball multi-floor canister is a lightweight machine that is purpose designed for any type of floor in your home. It comes with a host of attachments including a turbine head with a brush bar controlled by the trigger, a combination tool with small brushes, and a stair tool that works well on low to medium pile carpets. You also get whole machine HEPA filtration that is fully certified as asthma and allergy friendly by the Asthma and Allergy Foundation of America. This means the Ball was independently tested to remove the smallest of allergens like dust mites, mold spores, and pollen from the air before it is pushed back into your home. The filtration system is sealed up, leaving no room for any of these organisms to escape. The unique ‘Ball’ assembly provides a low center of gravity and 360 degrees of movement so the cleaner follows you around with almost no effort. They wanted to solve the problem of turning that most canisters have by removing the wheels and replacing them with something much better. It takes a little getting used to but you will quickly see the genius in the design. Click here to read our review for more in-depth information and recommendations should you decide to price it out. 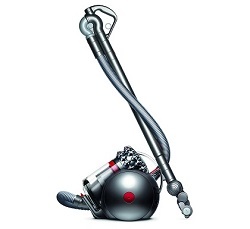 The Dyson Ball multi-floor 2 upright is more compact than their original model with even less weight to move around. It still boasts their powerful Radial Root Cyclone™ design that keeps suction powerful by forcing the air through specially designed channels. When the dust has no place to settle, the machine is much less likely to clog which really helps performance. Many features are included to make this a true ‘whole household’ cleaning machine. These include a long reach extension hose with multiple attachments, full HEPA filtration, lifetime washable filters, and a self adjusting head that easily transitions between different floor types. You can vacuum carpets, tile, hardwood, and more with minor adjustments. 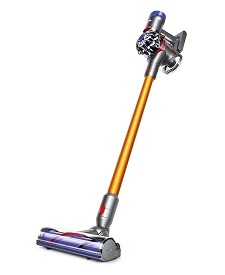 This is one of their most popular upright vacuums as it has a low purchase price and everything that Dyson is known for. It is an improvement over their original Multifloor which was always their best seller. For more information along with a quick video of the current features, click here for our detailed review. The all new Dyson Cinetic Big Ball canister has their latest technology that spins the internal tips with such force that the dust particles are separated from the air before it passes through the filters. The result is no cleaning or rinsing of any filter and of course no replacement bags to buy. There is virtually no additional cost to owning one. And like the multi-floor above, it rides on their Big Ball assembly for ease of steering around your home. But unlike that model, the Cinetic will self right itself should it tip over. It is uniquely designed with a low center of gravity which allows it to turn back over and keep on vacuuming. This saves time and effort as you won’t even have to turn around or shut the vacuum off. You also get a 360 degree articulating handle for the extension wand, a 35 foot reach via the electric cord and hose, and a carbon fiber floor tool that works well on carpets and hard floors. To learn more about it and see a video of it in action, click here for our review and overall rating. 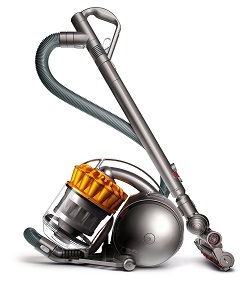 The Dyson cordless V6, V7, and V8 provide a lot of versatility and overall cleaning ability in a compact body. The base V6 works well on smooth floors and low pile carpets and rugs, but for maximum cleaning on just about any surface you would want to look at their V8 Absolute. Some of the models do come with HEPA post motor filters as a final trapping of any dust that makes it through the dual radial cyclones. The batteries are lithium ion and are designed to provide fade-free operation for the entire time. This means the suction will keep at a constant level as the battery is drained down. This solves one of the biggest problems that other cordless brands have. Another great feature is any of them will easily convert to handheld mode by simply removing the extension tube. You can operate it with any of the attachments to give you the ultimate in portable cleaning. This is perfect for cars and boats where you need to reach down in tight spaces, but still want the power to deep clean embedded dirt. Here is our review and comparison to help you decide on the best one for your specific cleaning needs. 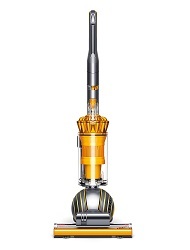 The all new Dyson V10 is their most powerful model to date. We compare it with the popular V8 to help you decide if it’s the best choice for your home, click here. 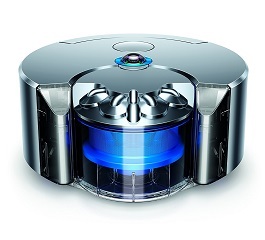 The highly advanced 360 Eye is a robot vacuum with all the built-in technology what you would expect from a Dyson. It is rated to have twice the suction power as the competition as well as high quality filtration to trap the smallest of particles from the air. This makes it quite unlike anything else currently offered today. Their Link App can be installed on your smart phone, allowing you to set the schedule and monitor the progress no matter where you are. You don’t have to be home to see when it is running and how much coverage it has provided, giving you the peace of mind that it is doing the cleaning you need it to while you are away. Plus you can view maintenance reminders and help videos without the need to keep cumbersome paperwork in your utility drawer. It’s a highly sophisticated vacuum that has just over 17 years of development behind it. Click here for our comprehensive review so you can learn more about the main features and how it differs from the other top brands.